Delta high-watt density cartridge heaters are fully swaged and can be applied wherever high temperature cartridge heaters are used. High-watt density cartridge heaters will deliver temperatures of 1,200 degrees Fahrenheit on the high-temperature alloy sheath. High quality nickel-chromium resistance wire used throughout assures reliable performance at elevated temperatures. Nickel pins or leads are swaged into the ceramic end cap, at the lead end of the cartridge. Standard 10” nickel, 450-degree Celsius fiberglass-insulated leads with insulation rated at 300 or 600 volts are supplied, optional lead types are available. High-purity magnesium oxide cores and filler materials swaged to rock-hard condition provide superb dielectric strength, while conducting maximum heat from the nickel chrome resistance coil. Metric and inch based dimensions are available. For more information about high-watt density cartridge heaters, download the Cartridge Heaters – High Watt Density section of our product catalog or contact us to order. Delta low watt density cartridge heater application can be efficiently designed using the low density cartridge. Quality and long life are not lost when specifying this heater to your application in molds, platens, and liquids. High quality magnesium oxide insulation and nickel-chromium resistance wires are used throughout the product. Standard and custom designs with various terminations are available. For more information about low-watt density cartridge heaters, download the …section of our product catalog or contact us to order. Delta Radius or Bent cartridge heater applications can be efficiently designed using the low density cartridge. Quality and long life are not lost when specifying this heater to your application. 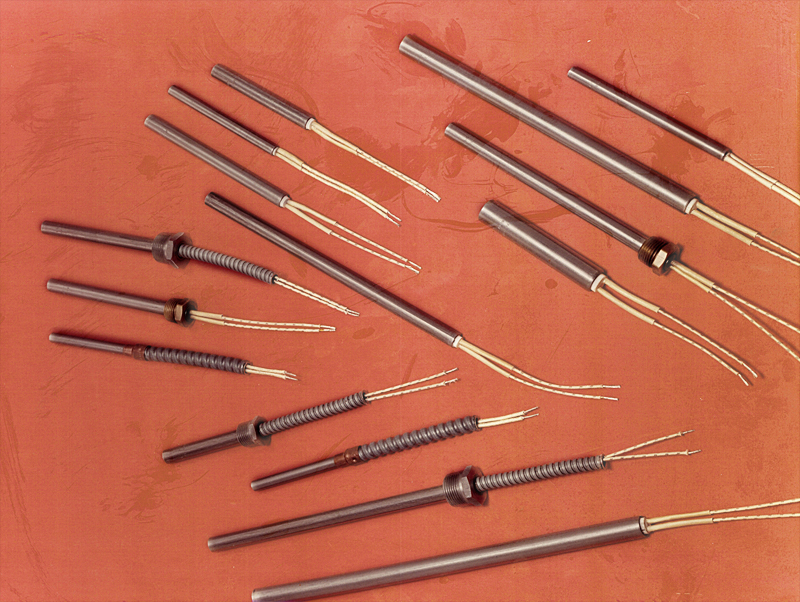 Cartridge heaters can be bent from to 90°. Heater must be bent in an unheated section and can be constructed with most of the options. High quality magnesium oxide insulation and nickel-chromium resistance wires are used throughout the product. Standard and custom designs with various terminations are available. For more information about radius/bent cartridge heaters, download the High Watt Density Cartridge Heater section of our product catalog or contact us to order. Bolt heaters are made using top-quality materials and offer supreme watt density and are built solid featuring alloy sheath swaged tubular construction, nickel/chrome alloy resistance wire, insulating handles, and more. We offer a large selection of standard diameters and lengths from which to choose. Using bolt heaters helps to give equipment components greater longevity by preventing thread galling caused by stress. For more information about bolt heaters, download the …section of our product catalog or contact us to order.